Common Snakes of Georgia: Georgia is set in south-east United States and because of where it lies, has a humid and subtropical climate, making it the perfect home for a number of reptiles such as snakes. 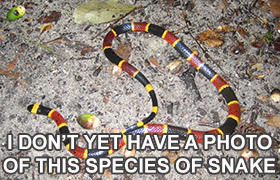 With only the odd occasional bout of what can be classed as ‘extreme weather’, the moderate temperatures combined with mountainous regions, several major and large rivers, rocky ledges and edges, and even barrier islands, it has plenty to offer a number of snake species and sub-species, one reason why there are so many that can be found here. Eastern Garter Snake: A medium-sized snake that can measure up to 26 inches (the longest recorded was just under 49 inches long), the eastern garter snake is renowned for eating a pretty wide and diverse diet, choosing worms, slugs, frogs and toads where they can. 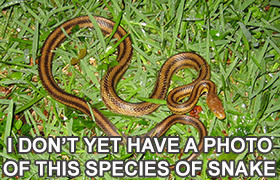 A “widespread and ubiquitous” snake, you can find this animal virtually anywhere from highly populated residential areas to grassy fields, trash dumps, stone walls, lakes and other water-logged areas (for their prey) and even in city cemeteries and parks. Brown Water Snake: Another snake known by a number of other names, you may have heard of it called the water-pilot, green water snake, southern water snake, water rattler or great water snake. 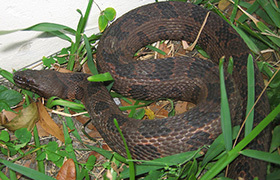 A heavy-bodies snake, it can measure up to 60-70 inches in length and is often confused with the water moccasin or cottonmouth snake because of the match in appearance and habitat - streams and swamps. 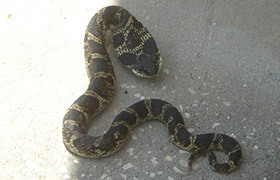 If you see a snake that looks similar to this, it is best avoided rather than handled. It’s doppelgänger is venomous. Scarlet King Snake : Often confused with a coral snake, the scarlet king snake is NOT venomous unlike its cousin. Often found in places such as pine-oak forests, flatwoods, cultivated fields and more recently, residential and busy human-orientated habitats. They seem to love garden swimming pools, one of the places many residents report to spot them. With black, white and red banding ,this snake may look threatening but it’s not, more likely to hide away than stay and fight. 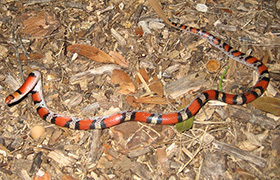 Another species of king snake you might just spot in Georgia is the Milk Snake, similarly patterned, measuring between 25 and 60 inches in length, another nocturnal snake. You can also add to this list Rat Snakes, Corn Snakes, and Indigo Snakes - all common snakes of Georgia. 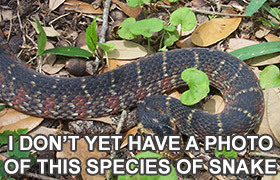 You may also find the Eastern King Snake, and the Mole King Snake in Georgia. 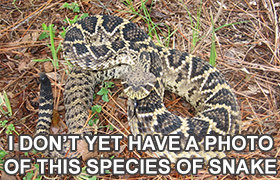 Hognose Snake: Both the southern hognose snake and the eastern hognose snake have had sightings in Georgia, snakes also known as spreading adders. Only growing to around 25 inches in length, these are relatively small, usually found in coastal areas and streams / ponds / marshes for their food source of frogs, lizards and toads. Eastern Ribbon Snake: A long and very slender species, the eastern ribbon snake is not only very thin but has stripes that run down the entire length of its body, earning it the ribbon name. 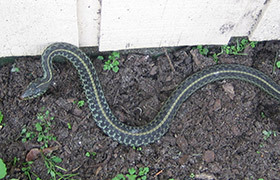 Usually dark with light stripes, it is found around wet areas much like the eastern garter snake - ponds, streams and wetlands for easy access to their food source - insects, frogs, toads, salamanders, small fish and tadpoles. Crown Snake : Both the southeastern crown snake and the central Florida crowned snake can be found in Georgia, although it is the former that you’ll likely find. Only growing to around ten inches in length, there’s a good chance you’ll miss this one, a snake that is somewhat venomous but only mildly, causing a mild irritation only. Queen Snake: A snake that looks very similar to the garter or eastern garter snake is the queen snake, a dark colored snake with stripes of white or cream, only growing to around 25 inches long. 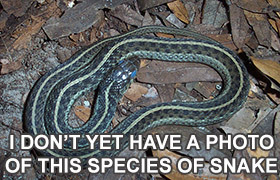 This is a very picky snake and requires a very specific habitat - there must be clean, fresh running water such as a stream, and when the snake is active and breeding, the temperature of the water must be a very exact 10 degrees celsius. This snake has a diet of 90% freshwater crayfish, hence the very specific habitat requirements. Earth Snake: Both the smooth earth snake and the rough earth snake can be found in Georgia, although sightings are rare with the animal choosing to live in leaf litter or buried underneath the ground in loose and damp soil. The rough earth snake is more likely to make an appearance, choosing forested woodlands and habitats and even within gardens in compost piles. 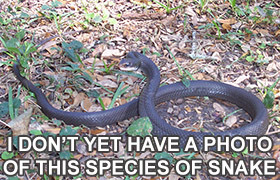 Black Swamp Snake: With three subspecies - north Florida swamp snake, Carolina swamp snake, and south Florida swamp snake, you’ll find the black swamp snake in heavily vegetated areas, usually around swamplands. These snakes are entirely water-dwelling snakes spending their time hiding around the water if not in it, and their diet reflects as such - frogs, toads, leeches, earthworms, etc. Pine Woods Snake: Another mildly venomous snake that doesn’t generally pose a threat to human life, the pine woods snake is one that can be found in somewhat scattered locations around the entire southeastern states of America. Only growing to around 13 inches in length, this is another tiny snake you’ll probably miss, especially as they choose to hide in logs and stumps, under bark in trees, and within damp woodlands, feeding on lizards and small frogs. Pine Snake: Not to be confused with the pine woods snake, the pine snake can also be known as the common pine snake, northern pine snake, pilot snake, white gopher snake, horned snake and even the common bull snake, is quite a large snake, measuring in at a maximum 8.5 feet in length. You’ll find this one in a number of places ranging from rocky deserts and cultivated fields to woodlands and open brush lands - anywhere you’ll find prey such as rats, mice, bird’s eggs, small mammals, and moles. Rainbow Snake: Also known as the eel moccasin, mud snake, horn snake, red-lined snake and sand snake, the rainbow snake is rarely seen by humans because of its nocturnal and highly secretive nature. Highly aquatic, they spend almost all their time in the water, feeding on frogs, toads, salamanders and even eels. The chances of being bitten by this snake is virtually slim to none - they don’t even bite captors.